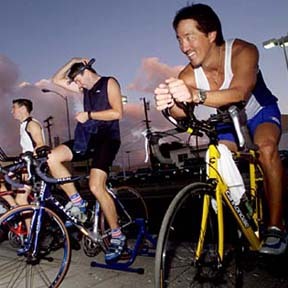 Guy Matsumoto, right front, and fellow Team Boca Hawaii training group members were hard at work on turbo trainers on Cooke Street yesterday preparing for Sunday's Tinman Triathlon. The group included Justin MacKenzie, left, and Josh Stinson. The race, which will start at Ala Moana and finish at Kapiolani Park, features an 800-meter swim, 40-kilometer bike race and 10-kilometer run.